The home of Don and Linda Young at 1103 Seminole is recognized as the August 2012 Yard of the Month. The Young’s provided the following: “We have lived in Richardson for 44 years, moving to the Reservation 10 years ago. Our two children attended Heights Elementary and graduated from Richardson High School. 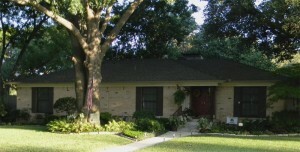 Now both children and their families live in Richardson. Don retired from the Dallas Police Department after 32 years of service. He currently works part-time at Restland Funeral Home. Linda volunteers at Network of Community Ministries after working 20 years as a church secretary. Since moving on Seminole, we have replaced the front steps and sidewalk and enhanced the flower beds with stone edging. Wood ferns have been added to the bed surrounding the huge oak tree. Since the lawn is so shaded, caladiums have been planted in several pots placed in various locations.